Pituitary prolactinoma is a condition in which a non-cancerous tumor of the pituitary gland. The brain overproduces the hormone prolactin. Although prolactinoma is not life threatening, it can impair the vision, cause infertility and can produce other side effects. it is the most common type of hormone-producing tumor that can develop in the pituitary gland. The pituitary gland is a small bean-shaped gland situated at the base of the brain. Despite its small size, this gland influences nearly every part of the body. The hormones secreted by pituitary gland help in regulating important functions such as growth, reproduction and blood pressure. Most prolactinomas occur in women between 20-34 years but can occur in both males and females at any age. It is rare in children. WHAT ARE THE SYMPTOMS OF PITUITARY PROLACTINOMA? The signs and symptoms of pituitary can result from the excessive prolactin hormone in the blood (hyperprolactinemia) or from the pressure on surrounding tissues from a large tumor. The elevated prolactin can disrupt the reproductive system. 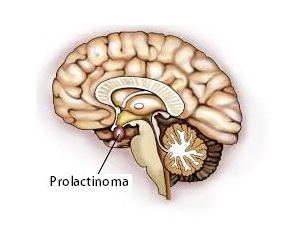 Some of the symptoms of prolactinoma are specific to males or females. Milky discharge from the breasts (galactorrhoea) when not pregnant or breast feeding. Irregular menstruation or no menstrual periods. Reduction in hormone production by the pituitary gland as a result of tumor pressure. WHAT ARE THE CAUSES OF PITUITARY PROLACTINOMA? WHAT ARE THE COMPLICATIONS OF PITUITARY PROLACTINOMA? Hypopituitarism: Because of larger prolactinomas, pressure on the normal pituitary gland can cause dysfunction of other hormones controlled by the pituitary resulting in adrenal insufficiency, growth hormone deficiency and hypothyroidism. Osteoporosis: Too much prolactin can reduce the production of estrogen and testosterone hormones which results in decreased bone density and an increased risk of osteoporosis. Complications in Pregnancy: During pregnancy, a woman’s production of estrogen increases. In a woman suffering from prolactinoma, high levels of estrogen may cause tumor growth and associated symptoms like headache and changes in vision. Vision loss: If left untreated, prolactinoma may grow large enough to compress the optic nerve. Blood tests can detect the over-production of prolactin and also detect whether the levels of other hormones controlled by the pituitary are within normal range. Brain imaging may be able to detect a pituitary tumor. Modern treatment for prolactinoma includes medications and surgery. Oral medications often decrease the production of prolactin and eliminate the symptoms but common side effects of these drugs include nausea, drowsiness and vomiting. 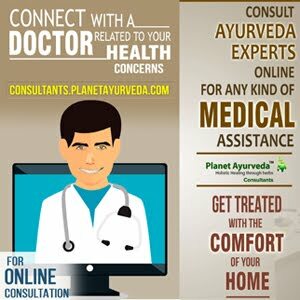 Ayurveda offers a great alternative to manage this disorder effectively without causing any side effects. According to Ayurveda, formation of tumor is due to vitiation of Kapha as well as Vata dosha because Kapha dosha is responsible for the growth of tumor cells and Vata dosha is responsible for uncontrolled cell division. Treatment offered by Planet Ayurveda balances both these doshas. Curcumin capsules of Planet Ayurveda are prepared from the standardised extract of Curcumin, a principal compound of turmeric. Curcumin possesses anti-inflammatory properties which help in reducing the size of the tumor as well as preventing its recurrence. It has powerful anti-oxidant properties as well. Its regular use protects from the damage caused by free radicals. Gotukola capsules of Planet Ayurveda are prepared from the extract of Centella asiatica that is traditionally used in Ayurveda for centuries. It is a wonderful for biochemical imbalances, environmental stress so it is one of the best herbs to treat the patients suffering from prolactinoma. These capsules also improve blood circulation and also have detoxification properties. Chanderprabha Vati is a classical Ayurvedic formulation which is prepared from 37 herbs and is widely used in ayurvedic practice. It cures cysts, fibroids and abnormal growths by shrinking the size of the tumor and also acts as a general health tonic for both men and women. Kanchnaar guggul of Planet Ayurveda is prepared from Bauhinea varigata. It is considered as an excellent tumor fighting herb as this herb effectively reduces the size of tumor, cysts or fibroids. This herb helps in shrinking the size of extra growth and also reduces the swelling and pain associated with tumors. 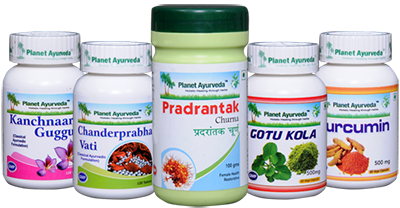 Pradarantak Churna is a pure herbal formulation by Planet Ayurveda which is prepared to take care problems of all the female reproductive health problems. It is an excellent herbal remedy that is very helpful in balancing the disturbed female hormones and uncontrolled growths. This herbal powder is a slight modification of classical Ayurvedic formula "Pushyanug Churna." The major ingredient of Pradarantak Churna is Saraca indica which naturally balances all the disturbed hormones. Dosage: 1-2 teaspoonful twice daily with water or juice.